China's waste import ban is having huge repercussions for Australia. We have got everyone used to recycling and it must continue.The real challenge is start at the beginning of all manufacturing processes and determine what we do not what want in waste to end up in our landfill. one example is expanded polystyrene foam used in flat pack furniture for transport and handling,this waste goes straight to land fill and there is lots of it.Moulded waste paper can be used to do the same job as the foam and then recycled again.We should be banning expanded foam in these packs which are imported or packed in Australia. we need small changes to get changes in manufacturing,one for me would be to ban small drink disposable bottles under one litre being made for water ,soft drinks etc only 1 Litre and upwards available,if people want to carry a smaller volume then buy a reusable metal bottle and refill it. We also need a nationwide School think tank project and get our youngest minds on providing ideas for waste reduction,new processing and pressing the Government for change. We must start now as landfill space will run out, then people will say why didnt we do something about this years ago. I am in the plastic recycling industry and our company produce a viable replacement for steel star pickets and timber posts out of 100% recycled plastic. The biggest challenge we face is getting the end users. Including councils to change their thinking. Buy locally produced products and help grow industry. Good work. Maybe government can look toward some kind of assistance in the way of marketing local manufacturers to create awareness around our own products being manufactured with our waste materials. As each state has passed legislation to ban the plastic bag, maybe state governments can look at implementing rules for the agricultural industry to buy a percentage of their consumables as made from recycled materials like yours. If farmers etc were forced to find more sustainable goods in this way, our local manufacturers will get the extra exposure needed to boost their businesses as well… win win! Nice work Helen, and what a great opportunity for Australians to manufacture products using these materials that have no home! Now that China isn’t underpinning prices there may be more scope for manufacturing here. We need smaller circles in the circular economy. And one for the conspiracy theorists: Is China just forcing the price down? On a more positive note…Imagine a cost effective technology that can cleanly disassociate organics into their simplest forms, a syngas comprising CO, H2 with the balance inert gases. Imagine though that this technology can be applied in innovative ways, enhancing recycling options by providing process heat & electricity to clean, separate and re-process materials for use by others, whilst converting the post recycling residues without adverse outcomes. Imagine it produces a solid carbon co-product suitable for waste water remediation, nutrient capture & recycling & dozens of other valuable uses. Imagine that at even modest scales, say 10t/hr & above it provides an economical front end to establish advanced manufacturing on the same site, producing transport fuels, industrial chemicals & fertilisers from the otherwise wasted resource normally sent to landfill…the ultimate in recycling & tool for circular economy. Imagine that, or come and see us at ID Gasifiers & no imagining is required. We have been working quietly for a while despite the rubbish occasionally thrown at us..
Our society needs to change its culture. Stop buying drinks in plastic maybe and go back to glass bottles with a bigger deposit. I know of a few people who return bottles to recyclers and get extra spending money. Maybe also, we could buy juicers and make our own juices for our kids, rather than getting them to drink coke! Not just coke but other more harmful drinks. Water too could come in glass bottles, after all, they never serve wine or beer in plastic! Scary! What are the clever countires doing? Like Sweden and Germany and Switzerland? And – I have seen an invention that turns plastic into fuel for vehicles – is that a farce or possible. Here is that link. https://www.youtube.com/watch?v=qGGabrorRS8 In the 1990’s I was studying sustainbility stuff at Uni – and there was a term – “End of pipe line” systems I think it was – where by the company producing the waste was responsible for it. Sweden was the country using that system way back then. Seems pretty simple. Those who produce it sould be responsible for it. We should have seen this coming. We are outsourcing our waste problems for a long time. Now it seems we are going to face recyclables piling at the landfills along with the general household junk if councils don’t find a solution…fast. However, there are options – temporary and more permanent solutions. I believe we will have to pay more for waste management services but the outcome could be positive. China decision is understandable and Australia also have to finally deal with what’s happening in our backyard. Everyone sees this coming. Like all the the other issues with unsustainable practises. But 99% of the population close there eyes to it. And thats not a slight on good people. Our lives are in such a constant state of flux that its easy to ignore and not feel guilty. Waste is just a small factor of the overall pollution issue within the world today. Most recycling initiatives in America, Australia, UK are simply paying lip service to the call for change. If you look at the known front runners in Europe regarding positive action on environmental issues you can see that measurable sustainable improvements can be implemented and long term change can come about. It all starts with honesty from the top. Thanks Kevin, unfortunately some narrowly focused suggestions posted by others which always seems to cloud these types of debates, which is to simply apply some sort of penalty and put recycling in an negative light rather than focusing on sourcing a cost effective/biodegradable substitute to plastics. And then they wonder people lose interest in this topic! Presumably there is also a need at the end/beginning of the circle for manufacturers to be forced to use more recycled product and customers to turn away from ‘new’ components to recycled. As well as just not buying so much ‘disposable’ (NOT!!!) stuff and going for long-term and re-usable. 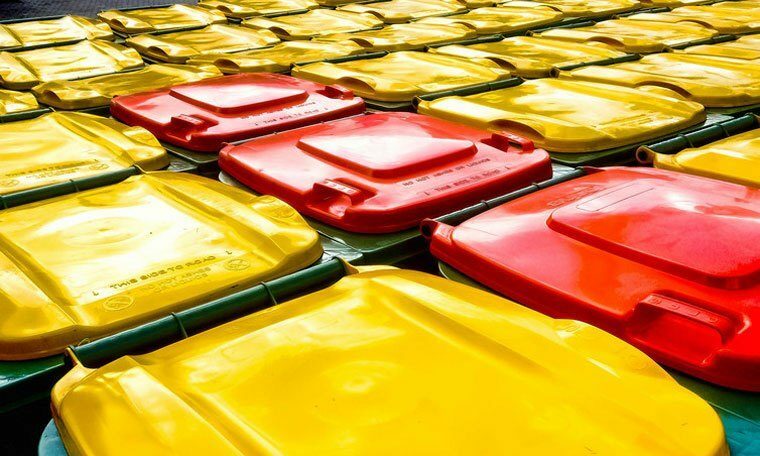 Couldn’t agree more – Australian business and households MUST change behaviour – we need to stop consuming and actively develop and adopt circular economy ways of delivering products. The other side of a crisis is OPPORTUNITY…. here is an idea to ponder to move us from our obsession with recycling. With around 2.17million active businesses in Australia, almost all having a cupboard with single use plastics containing chemicals. If these were replaced with an alternative like an on site generator eWater system we would divert 43.4 billion litre’s of toxic chemical residue from our waste water streams and conservatively REDUCE around 4 billion single use plastics from going into recycling bins or landfill. Now there is an idea worth spreading! Kevin, you statements about aluminum are not quite accurate. First, those “aluminum” crisp bags are a combination of aluminum and plastic. While they *might* get recycled in the aluminum plant, with the plastic burning off and the aluminum recovered, it is unlikely that they make it there and are considered contamination in most recycling facilities. Secondly, while aluminum *is* fully recyclable, only about 30% of it makes it into reuse, even with the ‘attraction’ to recyclers. And given that, the ecological footprint of all that wasted aluminum is enormous. Given the high melting point, it takes more energy to mine, smelt and process aluminum than all other metals on Earth combined. So, while recycling spares 95% of that energy footprint, that 5% is still substantial. Using aluminum for drink containers is ridiculous. Sure, they’re light. But the costs savings in trucking are shunted off to the future in terms of climate change. Not to mention that much of the initial processing of aluminum ore is done with the power generated from mega-dams that have flooded fast areas of forest, which in turn, generates methane. Those big dams have been shown to generate more climate impact than the same-megawatt fossil fuel power stations. Oh, and one more thing about aluminum beverage cans — they’re lined with plastic that contains BPA, a know hormone-disrupter. Those cans are the top source of BPA in people’s bloodstreams, with a heavy impact on people’s health. Glass, while heavy, is actually a lower-impact packaging material all-around. But for crisp bags, for me here in the US, they’re about the only packaging I can’t recycle and about the only thing I’m sending to landfill. I think ultimately, the solution is just not buying those (usually fried) products. Or perhaps we just have to make our own at home. One of the realities of looking more deeply at sustainability is that there are things we have to realize we just can’t do. Acceptance and humility are, in fact, the cornerstones of sustainability. Some interesting points you made about aluminium. Can you provide some citations please? Plastics are horrific. Apart from single digit recycling they are either being stockpiled, tipped or being shipped overseas for tipping or burning for energy. Excellent response. But ultimately, and I think you’ll agree, changing everyone’s practise to simply not purchasing certain packaging will never happen. Life is too complicated for most. What should happen is that materials which cannot or are difficult to recycle should be reduced and ultimately banned from production. Government has to take the lead and enforce change. Over 25 years ago I remember shops stopping plastic bags and only paper and boxes were available. Now we have gone full circle and they are everywhere again, because it’s easy and profitable. Agree with so many that plastic is one of the biggest problems we have in society. And not many even think about it. Hi Kevin! Agreed 100%- minus doubts about the aluminium recycling- is this happening in Australia or shipped overseas? I suspect neither. Happy to hear otherwise. We need to price the externalities. Packaged goods need to be more expensive.Embedded energy and end of life treatment needs to be built into the price. I agree with Kevin,we need regulation/government to get involved…the free market fails us again!! Plastics manufacturers should be required to take back and process all waste, if they can’t their business is terminated. Legislation banning all plastics in packaging and containers, the replacements for the bulk of these products already exist, aluminium cans for beverages, aluminum packaging wrap/bags used for crisps, peanuts could also be used as general purpose packaging for groceries. Aluminium is fully recyclable and will be recycled, the refunded collection cost is high enough to attract recyclers. Political will is the only requirement to solve these problems.